I have finally Gerry-rigged a way around not having the proper camera cord for the new/old camera that we have… until we find a cord that works, we’re just going to off-load the memory cards into the old camera, which doesn’t take pictures anymore but works wonderfully as a memory card reader since it still turns on and we have its correct cord. Complicated? Nah. We don’t do complicated around here. What we do is try to conserve and be resourceful. It’s no secret to most of our family and good friends that finances have been tight as we continue to seek paying off the unexpected debt accumulated over the last year. This becomes even more tricky when, say, I’m still not in a permanent work situation and we do something like coming to the end of the life of the tires on the car that Chris drives to work everyday. The result is that I’ve been trying to plan a little better, making use of each and every little piece of what we have in the house to eat. A week and a half ago, I sat down and planned our meals for the rest of the month and then went shopping – freezing a lot and trying to use produce that will go bad the fastest first. This has led to some interesting resourcefulness on my part. I normally forget that I can make things out of what is left over… Perhaps it is just a weird flaw when it comes to food, because I seem perfectly able to remember how to make use of every bit of the proverbial buffalo when it comes to crafting and making things work around the house. First, I have been trying to remind myself that I can freeze things that I make with leftover parts. I did this with a bunch of Roma/plum tomatoes (they were on sale, so I bought a few pounds more than I needed for our meals). I can’t eat canned soups (of any brand, it’s kind of sad), but I love soup. So, I set out to make my own tomato soup and froze it. I added a blanched red bell pepper to the mixture and didn’t use quite as much basil, since my basil crop is being overshadowed (literally) by the overgrowth of cilantro in my garden. I made use of leftover cans of vegetable broth that I had purchased for a meal months ago that turned into something else. The big thing here is that I used fresh tomatoes rather than canned. You can use canned tomatoes. I have plenty of cans in my pantry. Fresh ones were on sale, however, and I wanted to see how to use fresh ones to make a decent soup that I can eat without getting sick off of it. I had to boil the tomatoes, however, to do this. It is an extra step. Worth it, if you ask me, but I guess that’s really up to you. About $1.10 per serving, which is easily comparable to a can of Progresso or Campbell’s Harvest Select or whatever – and much tastier, in my opinion. Fill a pot with water, and set it on the stove top to boil. 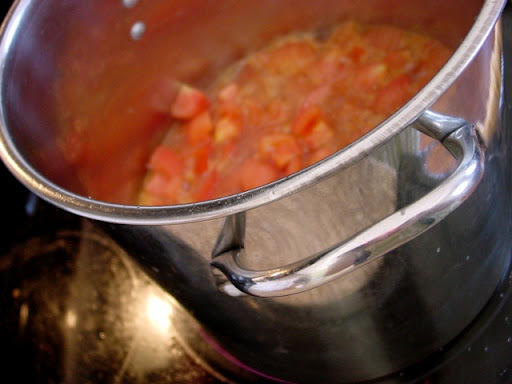 When the water boils, drop in tomatoes until you notice the tomato skins start to split (the tomatoes will also float to the top when this happens). My instructions told me 30-60 seconds, but it took quite a bit longer than that. 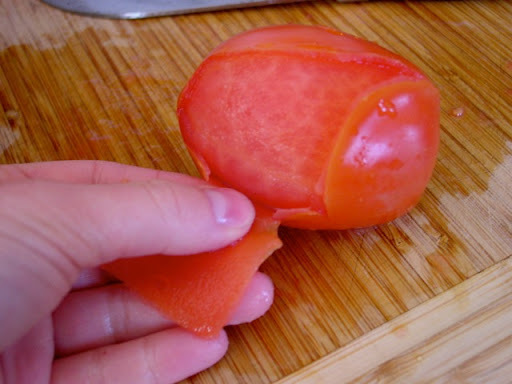 This step is simply to make it easy to peel off the tomato skins. 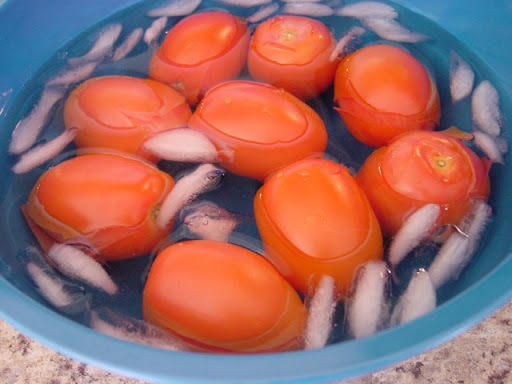 After the skins split, remove the tomatoes from the pot and place them in an ice bath to slow the cooking process, since the cooking will actually happen when you make the soup. After peeling them, I diced the 3 lbs of tomatoes that I used and continued with the rest of the recipe. 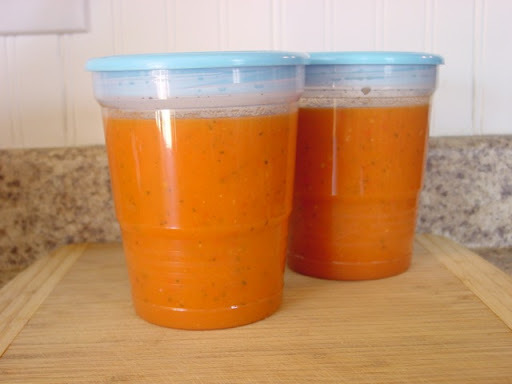 Made 2 quarts of soup. 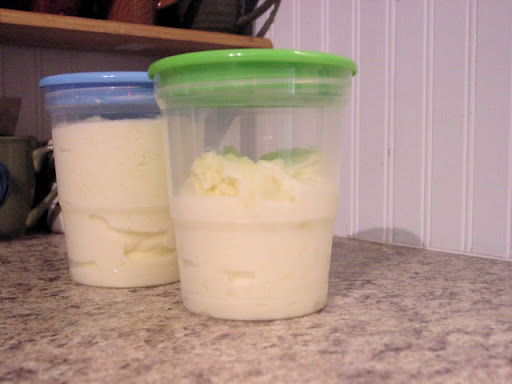 I put them in my Ball freezer containers (these are amazing), and put them in my freezer. Perfectly easy meals. Granted, we didn’t do more than dredge them in panko and fry them up in oil because we didn’t have any of the other ingredients on hand… but they were incredible. Not as good on the reheat, but definitely worthwhile the first time around. 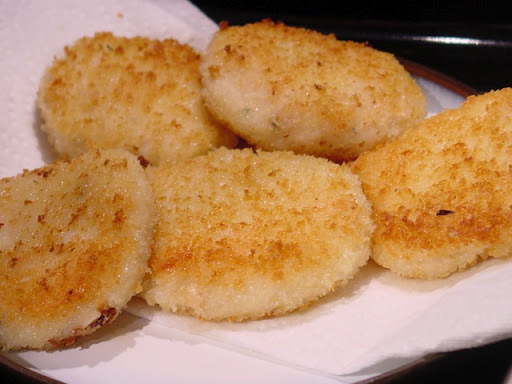 If you’re having a party, it would be great to make the risotto ahead of time (it makes a ton), dredge and refrigerate the patties, and then pull them out and fry them right before your event… totally would be an awesome party food. There was also a great deal on whole pineapples (97 cents apiece! ), so I bought two at Christopher’s request, and we mixed one of them with strawberries, bananas, and yogurt to make smoothies this last week. We had things leftover, however, including 5 bananas and a whole pineapple. Preheat oven to 350. Add sugar to melted butter gradually and blend together well. Blend in unbeaten eggs and bananas. Add milk and lemon juice and fold in nuts. Combine dry ingredients in a separate bowl. Add dry ingredients to sugar mixture and blend until combined. Stir in chocolate chips. Turn into a well-greased and floured loaf pan. Sprinkle with more almonds. Bake at 350 for 60-70 minutes (ours took 5-10 minutes longer), or until toothpick inserted in center comes out clean. Cool before slicing. NOTE: Can be made into muffins also – bake for 25 minutes in lined cups. Those who know me know that I love making my own ice cream. Part of it’s because I know exactly what’s in it (which is a good thing these days), but part of it’s because I can make exactly the flavors that I want. I used the extra pineapple to make 1.5 quarts of sorbet using this recipe that I found through Pinterest: http://www.twopeasandtheirpod.com/pineapple-sorbet/. Very tasty. I’m not sure what I think about Pinterest just yet, as I’ve barely dabbled, but it is an interesting resource when it comes to looking for ideas from other people’s blogs. It might prove a great asset to trying to use all the ‘buffalo’ parts. After I finish the next few rows of Christopher’s blanket (the chevron I started here), I might need to stop for a while until I’m able to get more yarn out of the ‘buffalo.’ It is coming along quite well, don’t you think? 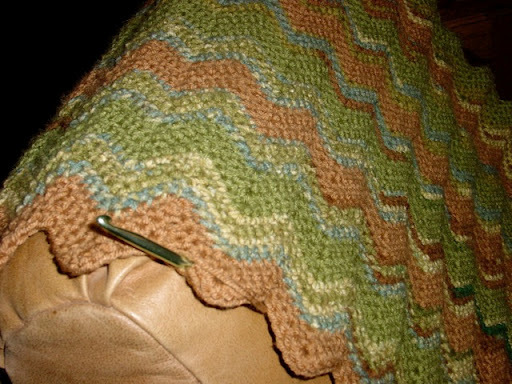 It has an awesome texture to it, and is finally at the point where it keeps me warm while I’m working on its rows. While waiting to get some new yarn, however, I’m likely start a new project using yarn that I was given when the awesome woman I work for decided she was going to give away a bunch of yarn while spring cleaning. Haven’t decided what kind of pattern I want to do, but I’ll be looking into that over the next few weeks. Regardless, I’ve been up to a lot of cooking and baking. I keep thinking that those don’t qualify as weekend projects, but that’s what I’ve been doing on my weekends! I’m hoping to get to my stack of creativity projects soon (maybe one this week, now that I know the camera works well enough to document the process), so keep your eyes out for that… Sick of the ‘buffalo’ analogy yet?